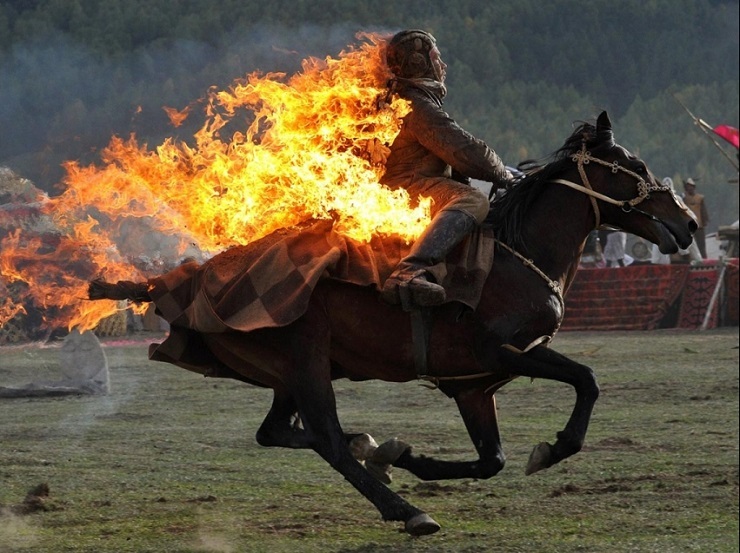 In early September 2018, Kyrgyzstan hosted the Third World Nomad Games. This is a unique international cultural and sports event that becomes increasingly popular every year and draws guests from around the world. The idea to hold an event dedicated to the folk traditions and sports competitions of the kindred peoples of Central Asia, the Caucasus and other regions had existed for a long time. In February 2011, at the press conference in Bishkek, it was announced that Lake Issyk-Kul would host the First Turkic Games in August 2011 which would see the participation of Turkic peoples from all around Eurasia competing in horse races, fancy riding, bow shooting, wrestling and other national sports. The aim of the event is to preserve and revive the culture and strengthen the friendship of the Eurasian nomadic peoples living in various countries. Kyrgyz and Kazakh philanthropists initiated the project. In 2012, the Kyrgyz Government came up with a similar project with the same objectives and a similar name: the World Nomad Games (WNG), however, following the logic of such naming, the range of possible participants had expanded considerably. This project is considered to have been initiated by the Kyrgyz President Almazbek Atambayev in person, who proposed to carry out the project at the regular session of the Cooperation Council of Turkic-Speaking States (CCTS) whose member countries are Azerbaijan, Kazakhstan, Kyrgyzstan, Uzbekistan and Turkey. The First WNG were held in September 2014 in the city of Cholpon-Ata in the Issyk-Kul Region. Lake Issyk-Kul, the largest Kyrgyz lake which is famous for its beauty, was considered the best place for holding the event of this kind. 583 athletes from 19 states took part in the competitions in 10 ethnic sports disciplines and the cultural program involved 1,200 people. The event received a lot of TV coverage. The Second WNG were held in the same place in September 2016. Over 1,000 athletes from 62 countries took part in them and over 500 m people around the world watched the competitions on TV. On September 2, 2018 the solemn opening ceremony of the Third World Nomad Games took place, it was hosted by the Kyrgyz President Sooronbay Jeenbekov. The ceremony was attended by the Turkish President Recep Tayyip Erdoğan, the Kazakh President Nursultan Nazarbayev, the Head of Tatarstan (Russian Federation) Rustam Minnikhanov and other high-ranking guests. Cholpon-Ata became the principal venue of the WNG once again. This time, almost 2,000 athletes from 74 countries took part in the competitions. The WNG are open to all peoples, even those that abandoned the nomadic lifestyle many centuries ago. For instance, teams from Belarus, France, Sweden, the USA, Israel and many other countries that see nomadic life as something rather exotic, took part. Russia participated in the WNG as well, though this came as no surprise since there are many peoples living in the Russian Federation who used to have a predominantly nomadic lifestyle not so long ago. The WNG participants competed in 37 sports disciplines. Naturally, the equestrian sports competitions were paid special attention at the World Nomad Games. There were 6 types of horse races only (with a different set of rules for each one), apart from that, the riders competed in fancy riding, Er Enish (wrestling from horseback) and bow shooting from horseback. Moreover, the riders competed in the ancient game of kökbörü (buzkashi) in which teams on horseback compete to gain possession of a headless animal carcass (a goat or a ram) and bring it to a scoring area. Wrestling was featured well too. The WNG participants compete both in the traditional wrestling sports of Turkic peoples (alysh, goresh, kuresy, etc.) and in exotic wrestling disciplines such as the Japanese sumo, the Russian sambo and the Korean ssireum. Representatives of the traditional bow shooting schools from Kyrgyzstan, Turkey, South Korea and Hungary showed their skills too, as well as skinful pros in falconry who used both falcons and golden eagles. Intellectual games enthusiasts played tabletop games belonging to the mancala family that are widespread across Asia and in several regions of Africa. Naturally, the WNG have a much greater significance than that of a mere sports competition. The originators of the event said in the very beginning that it served the purpose of studying, preserving and developing the original culture of peoples around the world and instilling tolerant interaction among them. A lot of attention is paid to preserving the conventional image of the world and the nature that has had a great influence on the formation of folk cultures. Thus, the ounce (the snow leopard) who inhabits the mountains of Central Asia became the official mascot for the Third WNG. This wonderful animal is on the verge of extinction, and choosing it as the mascot for the Games became a new way to attract more attention of the public to its future. Apart from the competitions among jigits (horse riders) and strongmen, the event included a cultural and a scientific program. The Nomad Universe Festival was held concurrently with the Games, its guests had an opportunity to experience the everyday life of nomadic peoples: see the way their abode is organized, purchase items of their traditional crafts, see the performances of centuries-old dances and listen to the folk epic tales told by skilled narrators. The scientific forum World Nomad Games: their historical heritage and future was held during the WNG as well. The forum featured the discussion of a very wide range of issues connected with the past, present and future of the nomadic peoples and touched upon such disciplines as history, ethnography, cultural studies, physical education and ecology. Politicians also didn’t fail to use such a large international event to meet and discuss the issues of international relations. On September 3, 2018 the city of Cholpon-Ata hosted the Sixth Summit of the Cooperation Council of Turkic-Speaking States (CCTS) with the participation of the leaders of Azerbaijan, Kazakhstan, Kyrgyzstan, Uzbekistan, Turkey and Hungary, the latter acting as an observer for the CCTS. Since the meeting was held at the beginning of the WNG, a lot of attention was paid to the issues of youth policy and developing the traditional sports. However, the cooperation in this area can become the beginning of a much larger interaction between the Turkic states. These countries have been disengaged for a long time: for instance, Azerbaijan, Kazakhstan, Kyrgyzstan and Uzbekistan used to be part of the USSR, and now Kazakhstan and Kyrgyzstan are party to the Collective Security Treaty Organization alongside Russia, Belarus, Tajikistan and Armenia, while Turkey is a NATO member state. At the same time, the Central Asian republics are experiencing a continuously growing economic influence of China. Given these conditions, the Turkic states find it difficult to coordinate their actions, though cultural cooperation, such as the WNG, which reminds the citizens of these states of their shared past, may become the first step towards the creation of sound economic and political ties. In conclusion, one may say that events like the WNG help people understand the cultures of other peoples and get a better understanding of one’s own culture. These are 2 crucial conditions for the harmonious development of international relations.